Researchers at Vanderbilt University Medical Center and the University of Alberta in Canada have identified a biomarker for a cellular switch that accurately predicts which prostate cancer patients are likely to have their cancer recur or spread. 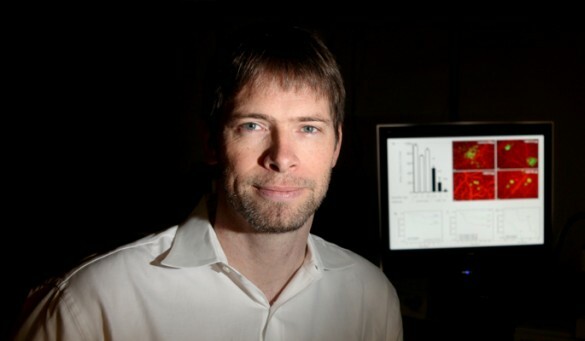 The study, posted online recently in advance of publication in Cancer Research, was led by co-investigators Andries Zijlstra, Ph.D., assistant professor of Pathology, Microbiology and Immunology and Cancer Biology at Vanderbilt, and John Lewis, Ph.D., associate professor of Oncology and Frank and Carla Sojonky Chair in Prostate Cancer Research, University of Alberta. Prostate cancer is the second leading cause of cancer-related deaths among men in North America. While some prostate cancer spreads slowly and does not lead to serious symptoms, in other patients the cancer metastasizes to other parts of the body and proves fatal. Cancer researchers have been searching for biomarkers that indicate which patients should be treated aggressively and which patients can be followed through active surveillance. Zijlstra and his colleagues have been investigating a protein called CD151 that facilitates the migration of cancer cells. In prostate cancer cell lines, they discovered that CD151 is free from its normal adhesion partner (integrin) — another protein that allows a cell to stick to the surrounding tissue. This form of CD151 called “CD151free” proved to be functionally important in cancer. In collaboration with Lewis and colleagues in Alberta, the group looked at tissue samples from 137 patients treated for prostate cancer in Canada over the past 12 years. The team determined that if patients tested positive for CD151free their cancer recurred and spread earlier than patients without any detectable CD151free. “Patients who tested positive for the biomarker developed metastasis an average of 10 years earlier than those who tested negative,” said Lewis. Preliminary work in other solid tumors besides prostate cancer suggests that this may be a universal mechanism important for cancer progression. Lewis and Zijlstra said the integrated collaboration among basic scientists, physicians and bioinformatics/biostatisticians led to these results which should be useful for patient management. The group is working on development of an antibody test for use in the clinic. The study was supported by funding from the National Institutes of Health (CA143081 and CA120711), Motorcycle Ride for Dad, and the Canadian Cancer Society Research Institute (Grant 700537). Other investigators involved in the research include lead author Trenis Palmer, Ph.D., Katie Hebron, B.Sc., Celestial Jones-Paris, B.Sc., Shanna Arnold, Ph.D., Giovanna Giannico, M.D., Tatiana Ketova, Ph.D., Vanderbilt, Catalina Vasquez, M.Sc., Andrew Williams, M.D., University of Alberta, Carlos Martinez, M.D., Susanne Chan, M.D., Venu Chalasani, M.D., Joseph Chin, M.D., Translational Prostate Cancer Research Group, London, Ontario, Jose Gomez-Lemus, M.D., University of Western Ontario.